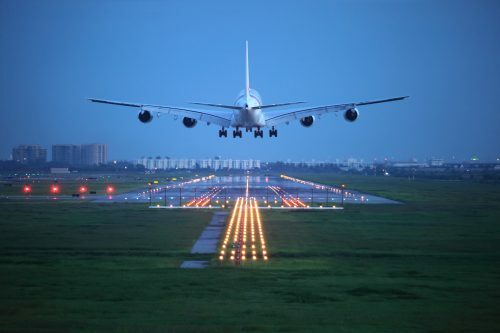 Data centers are mission critical facilities that run operations with profound significance. They are prevalent in industries including healthcare, telecommunications and information technology, BFSI, government and public sector, energy, and many more. (1) Businesses and infrastructures rely on these data centers to store sensitive data and support mission critical applications. The continuous operation of these facilities in these industries is critical and unplanned downtimes are costly. Therefore, there is a need to protect these data centers. 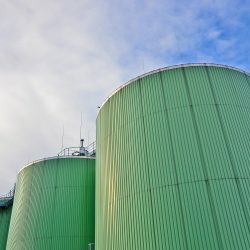 Polymeric technology can offer solutions to these facilities and allow them to continue their critical operation across various industries. Data centers represent an expansive and profitable market. There are currently three main types of data centers: on-premises, colocation, and cloud. On-premises. 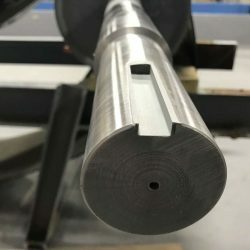 Client company is responsible for their own equipment (owning, using, and maintaining), infrastructure, and entire operating costs (power cost, cooling, communications, data center floor space). Regulations (concerning sensitive data), security, and accessibility are some of the reasons companies choose on-premises data centers. These data centers are becoming less common. Colocation. Client company is responsible for their own equipment but share operating costs with other companies.2 Some colocation providers also offer maintenance. Regulations, security, shortage of existing data center, secondary back up data center are some of the reasons companies choose colocation data centers. Cloud: Cloud providers supply the client company with equipment (servers, storage, and network) and manage maintenance in a shared facility with other companies.2 Outsourcing infrastructure management, reduced capital expenditure, operating expenditure, and flexible scalability are some of the reasons companies choose cloud data centers. There is a shift towards these data centers. Carrier-neutral: Data center is not bound to any one service provider (telecommunications, ISP, etc.). This is popular as it provides customers with more options (price, bandwidth, etc.). They tend to be in areas with high competition. Non-carrier-neutral: Data center is bound to one service provider. 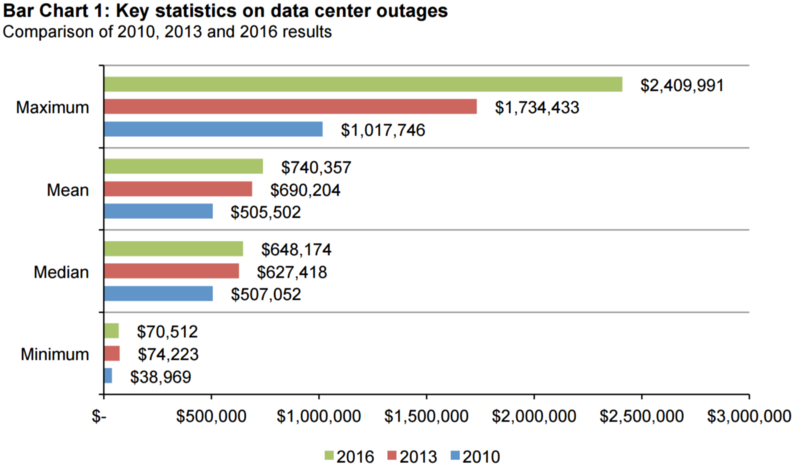 The cost of downtime for data centers has been thoroughly researched by Ponemon Institute, sponsored by Emerson Network Power, since 2010. A research paper is published every 3 years with the latest one published for 2016. The study for 2016 analyzed 63 data centers ranging in industries from communications to healthcare to transportation. Out of the 63 data centers, 10 were colocation data centers. 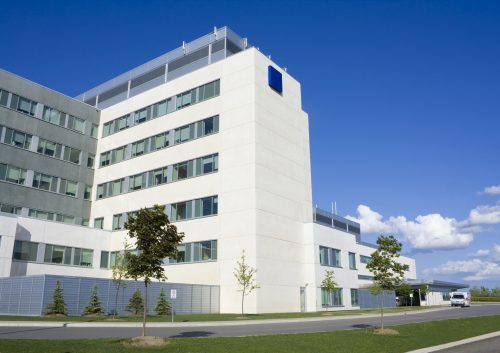 The average square footage of the data centers analyzed were 14,090 sq. ft. with a maximum square footage of 55,000 sq. ft. (8) The colocation data centers are most likely on the higher end in terms of square footage. 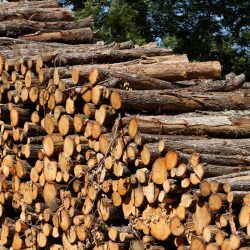 According to the study for 2016, the average cost per minute and average total cost of an unplanned outage was around $9,000/minute and $740,000, respectively. The total cost of an unplanned outage was as high as $2,400,000. Colocation data centers are most likely on the higher end of the costs due to the larger sizes. The majority of costs come from lost revenues and business disruptions. 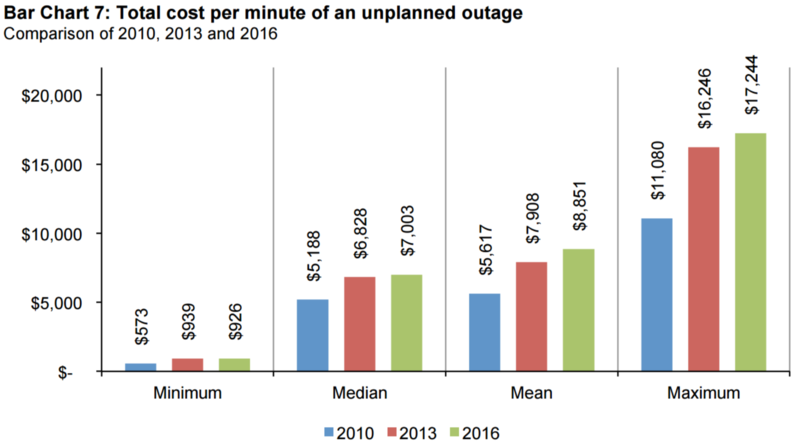 It is important to note that the cost of outages has steadily increased since 2010. (8) This trend may only continue as businesses become more and more dependent on data centers. The importance of preventative maintenance in data centers cannot be overstated. The contrary to preventive maintenance is reactive maintenance. Under reactive maintenance, repairs are only carried out after the equipment has broken down. About 55% of the maintenance in the average facility is conducted under reactive maintenance and the percentage is notably higher in data centers. Maintenance in data centers includes HVAC system, Uninterruptible Power Supply (UPS), generators and building. The cost of maintenance in data centers is roughly 2% of the annual budgets. However, there are many unintended consequences of reactive maintenance that is often overlooked. Repairing equipment after it is broken means that there can be loss or corruption of data, shorter life time expectancy of equipment, increased energy costs, inefficient use of resources, and safety issues. This all leads to higher costs in the long-term. There is also the added complication of being unable to control maintenance budgets. 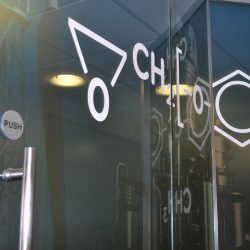 It is important to monitor the temperature and humidity in data centers. Electronics generate heat during operation that needs to be dissipated. If the heat is not dissipated and the temperature is too high, electronics can experience reduced efficiency and even failure. In data centers, the high number of electronics operating leads to a high heat generation that needs to be constantly cooled. Normally, higher end equipment automatically shut down when the temperature is too high. A shutdown results in downtime. In addition, the system will usually experience computation errors and application errors before it shuts down. The cooling fans in the system may be overworked during this time as well, reducing life time expectancy of the equipment. With equipment that does not have this automatic shutdown, the consequences of high temperatures are more severe. Low humidity can cause buildup of static electricity on the equipment and high humidity can cause corrosion to occur on the equipment. In order to prevent any reduced efficiency and downtime in these data centers, it is crucial to control the temperature and humidity. 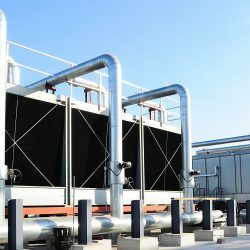 Due to the importance of temperature and humidity control, data centers place emphasis on HVAC systems. There are two main types of HVAC systems for data centers: CRAC and CRAH. CRAC (Computer Room Air Conditioner): Air is cooled by a cooling coil with refrigerant.12 Similar idea to HVAC systems in small buildings. Generally used in smaller data centers. 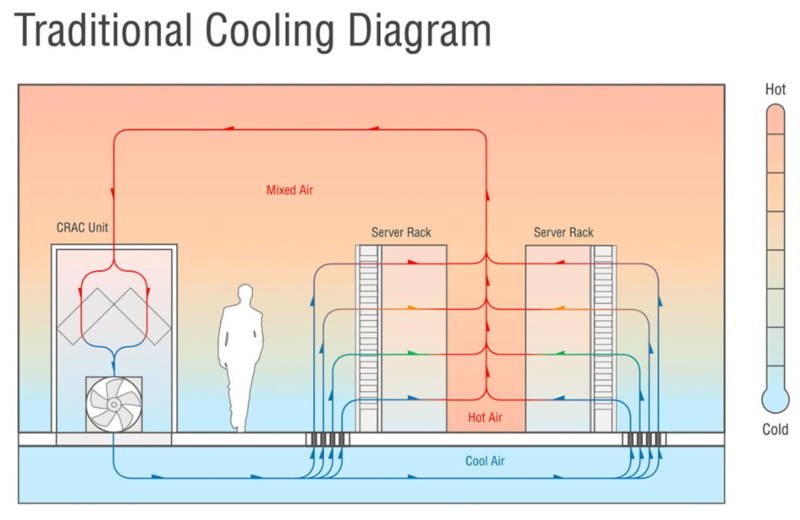 CRAH (Computer Room Air Handler): Air is cooled by a cooling coil with chilled water and the chilled water is cooled through the combination of chiller and cooling tower.12 Similar idea to HVAC systems in large multi-story buildings. Generally used in larger data centers. 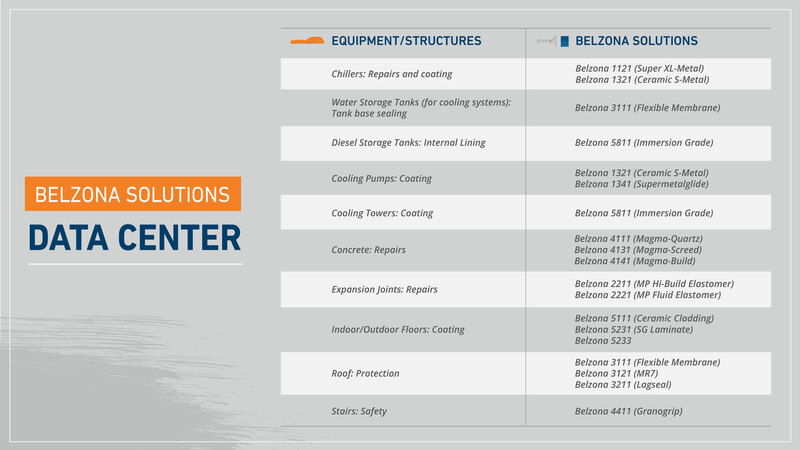 Belzona already has many of the solutions that data centers require for HVAC maintenance: chiller tube sheets repair and protection, HEX leak sealing, air handler condensate and drain pan sealing and lining, sealing of joints and seams in cooling tower pans. Data centers also frequently require concrete and expansion joint repairs, step repairs, non-skid floor coatings, safety grips systems, sidewalk, entry concrete repairs, fountain leak sealing and protective lining, floor coatings, uneven threshold transition repairs. 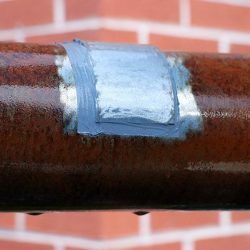 The pipes that carry chilled water may need repair and erosion-corrosion protection to prevent leakage and stairs may need grip systems for safety.